Labor Day Weekend has finally arrived, and we are ready to put the summer heat behind us and move into the cooler autumn months here at the Villages of Citrus Hills. For our residents, that means that the activities and events calendar is filling up with all kinds of fun things that you want to be aware of. Whether we are talking about exciting social events, golf and tennis competitions, or great dinner specials at our community restaurants, there is constantly something to do throughout the month of September. Let's take a closer look at some of the major activities and events this month! members and their guests boogying all night long. There will be a Crime Prevention Workshop in the Activity Center Auditorium on Monday, September 10 at 1 pm. This workshop will be led by former law enforcement officers in our community, and it will provide insight into helping citizens be more aware of potential threats. Tasty Trivia Tuesday is also back this month with a night of random knowledge in the Hampton Room on Tuesday, September 18. Dinner for this event will include Boursin Stuffed Chicken Breast and Sliced Sirloin in Mushroom Sauce along with salad, sides, and dessert. Another big event in the Hampton Room this month will be stand-up comedian Carl Guerra hosting a Comedy Dinner Show on Wednesday, September 26. You won't want to miss this high-energy comedy act, or the delicious meal that will be served with the performance. September also marks the end of the baseball season, but the Citrus Hills Vacationers Club has one big trip to see the Tampa Bay Rays left on the calendar for the 2018 season. On Thursday, September 27, they will be taking a bus down to Tropicana Field to see the Rays host the surging New York Yankees. The big golf event of September will be happening right at the beginning of the month on Saturday, September 1 when The Oaks Course at Citrus Hills hosts the Labor Day Open. Beverages and lunch will be provided after this fun holiday event, and you can get more information in the pro shop. There will also be free golf clinics hosted by Mary Slinkard happening throughout the month of September. And no matter where your game is at this time of year, everyone could use a little tweaking heading into the big October events like the Skyview Member-Member Tournament, the Citrus Hills Ghost Open, and the Skyview Men's Club Championship. The Skyview Tennis Center will be hosting its monthly Free Beginner Tennis Clinic on Tuesday, September 11 at 11 am. If you are thinking about getting into tennis this fall, this is the perfect opportunity to get some free coaching to improve your game in a hurry. The big dinner event at Skyview Restaurant this month will be the South American Wine Dinner on Tuesday, September 11. This fun dinner will feature four separate courses that are each paired with a unique South American wine, but it is limited to 50 guests, so make sure you make your reservations fast! September 19, and a Barbecue Rib Night on September 26. And don't forget that the Tiki Bar is the place to be for all the college football and NFL action when it kicks off this month! Facial special happening all month long at BellaVita Spa. And while you have your calendars open, check out what you have planned for New Year's Eve, because tickets for the New Year's Eve Gala in the Hampton Room go on sale September 1! It's no secret that there are more than a few great restaurants here in Citrus County. In fact, we have three outstanding options right here at the Villages of Citrus Hills. With so many choices available, there are bound to be some restaurants that slip through the cracks when we are deciding on a place for dinner. And on top of that, there are always new places opening up all around our community. To help you keep your dinner plans fresh and exciting, we pulled together a list of five excellent restaurants that you might not know about just yet! One of the newest on the Citrus County restaurant scene is Kelly's Half Shell Pub in Crystal River. This new joint is all about oysters, and you can order them just about any way you like! Oysters Rockefeller is popular, but if you are feeling brave, we recommend trying their Spicy Raw Oysters! In addition to the half shell menu, Kelly's also has some killer pub food with feature items like Reuben Eggrolls, Irish Poutine, Guinness Mussels, and Yellowfin Tuna Sashimi. Another new restaurant that just recently opened its doors is Los Magueyes of Inverness. They specialize in authentic Mexican cuisine, and according to a number of local diners, they are absolutely knocking it out of the park. going to be prepared just like it would be if you were actually dining in Mexico. Ole! Because one new Mexican restaurant just wouldn't be enough, Inverness has also welcomed Habaneros Mexican Grill to the local dining scene recently. And while Los Magueyes of Inverness is the place for great salsa, Habaneros is where you should be going to satisfy your guacamole cravings! The menu here is every bit as authentic as Los Magueyes of Inverness, so you can definitely add it to your regular rotation of local Mexican options. As you drive through Hernando, you might not even notice the next restaurant on our list, but this nondescript white building is the home of some of the best BBQ in Citrus County today. One thing that patrons are loving about Sauced Hogs is that their menu is not exclusively BBQ items. In addition to serving up some awesome BBQ plates, you will also find a great Reuben sandwich here, as well as some solid burgers and salads. While it is not a new restaurant, the fact that it is located inside Plantation on Crystal River has kept West 82 Bar & Grill off of the radar of many Citrus County diners. However, the food you will find here is nothing short of exceptional. With appetizers like Smoked Mullet Dip and Baked Brie and Wild Mushrooms, you can tell from the very first bite that everything you eat at West 82 is going to be amazing. Everyone at the Villages of Citrus Hills knows that the food at Skyview Restaurant, The Grille, and the Tiki Bar is outstanding. But when the situation calls for something outside the gates, these five restaurants in Citrus County are more than happy to step up and serve you! The height of summer is here, and we are only one month away from rolling through the Labor Day holiday and cruising straight into the cool fall months when the activities and events really heat up here at the Villages of Citrus Hills. But just because we are excited about the coming fall season, don't let yourself overlook some of the activities and events that will be happening over the next few weeks in our community. Whether you are looking for fun social events, competitive sports and recreation, or just a great meal, we have the inside scoop on what's happening at Citrus Hills this month! The first big social event of the month will be the Magic & Comedy Dinner Show featuring Jon Armstrong on Tuesday, August 14 in the Hampton Room. This fun-filled magic comedy show will start at 7 pm following a dinner of Roasted Pork with Cinnamon Apple Glaze, Bourbon Salmon, Buttered Herb Noodles, and Steamed Mixed Vegetables. Trivia Tuesday is back in the Hampton Room on Tuesday, August 21. The Sharks took down the contest with 50 points last month, but August is a new month, and everyone is ready to compete. Dinner for this month's Trivia Tuesday will feature Chicken Marsala and Baked Haddock. Then the biggest party of the summer will happen on the very last day of the month when Copacabana Night takes over the Hampton Room on Friday, August 31. The fun will start with a Latin-themed dinner of Cuban Pulled Pork and Chicken and Peppers in Garlic Wine Sauce. Then, things will really get wild when a 10-piece Latin band takes the stage. Don't leave your dancing shoes at home for this one! Sports fans will also want to be sure to book their tickets this month for three fall trips that the Citrus Hills Vacationers Club is planning. There will be a group heading down to see the Tampa Bay Rays host the New York Yankees on Thursday, September 27. The club is also planning trips to see the Tampa Bay Buccaneers on Sunday, November 11 and Sunday, December 2. The Oaks Course at Citrus Hills will be the place to be on Saturday, August 4 when they host the Awesome August Open. This fun outing will be a great way to prepare for some more serious ones like the Citrus Hills Labor Day Open, Skyview Ryder Cup Tournament, and Skyview Men's Shootout happening in September. Another way to gear up for those September tournaments is to stop by the driving range at Skyview. And they just happen to be running a special from August 6 through August 12 that will hook you up with 10 FREE buckets of balls if you buy or upgrade an electronic range key. There will also be Free Golf Clinics with Mary Slinkard happening throughout the month of August. Mary will be working with beginners on August 6, 7, and 8. Then she will be back for intermediate clinics on August 14, 21, and 28. Anyone who is new to tennis will find plenty of helpful coaching at the Free Beginner Tennis Clinic held at the Skyview Tennis Center on Tuesday, August 14. All golf and social members are invited to attend, and no equipment is required. Other competitive events happening around the community this month include a fun Wallyball game at BellaVita every Wednesday from 4 pm to 5 pm and a Pickleball 101 event happening on the first and third Thursday of the month. Our friends at Skyview Restaurant are really going to be testing our diets this month with a Turkey Buffet special on Tuesday, August 14 and a European Pub Night on Tuesday, August 28. The Turkey Buffet will include all of your favorite Thanksgiving foods, and the European Pub Night be featuring entrees like Jameson Glazed NY Strip, Fish & Chips, and Braised Lamb Shank. Sunday, August 26 is National Hot Dog Day, and The Grille is celebrating with a hot dog special from 3 pm to 8 pm. Dress your dogs up however you like with chili, cheese, sauerkraut, onions, tomatoes, pickles, and more! And if you find yourself craving hot dogs at other times during the month, don't forget that every Wednesday is Wing Dog Wednesday at The Tiki Bar with 30 cent wings and $3 hot dogs. In addition to all of the fun events and activities happening around the Villages of Citrus Hills this month, BellaVita Spa is offering a Peppermint & Rosemary Muscle Soothing Massage all month long. Warm weather is one of the biggest reasons that Florida is such a popular retirement destination, but many residents will agree that there are times during the summer months where that heat can detract from some of the popular outdoor amenities here at the Villages of Citrus Hills. Fortunately, there is also a great selection of indoor activities available to our members. So, when the heat index gets to be just a bit too much, these are some of the things we recommend doing around the community to enjoy your days without spending too much time in the heat. One of the newest places to beat the heat at the Villages of Citrus Hills is the Coffee Shop. Spend a few minutes soaking up the cool air conditioning and you will be primed and ready for a great cup of coffee to accompany whatever summer reading you have set out to work on this year. The Coffee Shop is located right between the Citrus Hills Pro Shop and PrimoVita. They are open from 7 am to 11 am every morning during the summer and you can get a FREE refill on any medium or large coffee on Fridays. For many residents who are looking to avoid the heat, they need to replace the exercise they would be getting from whatever outdoor activities they are not participating in, so heading to one of the community fitness centers can be a great way to stay inside without missing out on those Fitbit steps. BellaVita and PrimoVita both offer state of the art exercise equipment and lots of fun classes to keep you moving throughout the summer, all while enjoying the cool indoor temperatures. Speaking of BellaVita, you can also spend some quality indoor time at the spa! Because who doesn't love a good spa day, right? We make a point to mention the BellaVita Spa Specials of the month in our monthly Activities and Events blogs, but you can also catch those specials in your Connections Newsletter each month. Joining one of the many clubs that exist around the community is another great way to get yourself involved in an indoor activity over the summer. With ballroom dancing, billiards, bridge, mah-jongg, and wood carving, there are plenty of indoor options to choose from. One of the most active clubs at the Villages of Citrus Hills is the Citrus Hills Vacationers Club, which would be a great place to start if you are looking to attend an interesting meeting. Another great way to pass some time indoors this summer is to head over to Skyview Restaurant for their Happy Hour specials every Thursday, Friday, and Saturday from 5 pm to 8 pm. There are always great drink specials to be had, and you can either order dinner from the bar menu or head into the restaurant following a few drinks. Of course, the Tiki Bar is also a great place to enjoy a few cocktails during the warm months, but you might want to wait until after Happy Hour at Skyview Restaurant to head over there so that the outside air has a chance to cool down a bit. No matter how you prefer to spend your time, there are plenty of fun and exciting indoor activities around the Villages of Citrus Hills to keep you busy all summer long. So, don't let the warm weather get you down, stay active indoors! Summer has officially arrived here along the Gulf Coast of Florida, and the activities calendar here at the Villages of Citrus Hills is heating up right in step with the temperature. This month, our activities and events include a number of old favorites with some exciting new ones mixed in to keep things interesting. The first social event of the month will be the "Broadway and Beyond" Dinner Show in the Hampton Room on Wednesday, June 6. Mary Jo Vitale will be taking center stage to perform a selection of Broadway hits, opera classics, and more, following a delicious meal of Sliced Sirloin topped with Mushroom Gravy and Bourbon Pecan Chicken. Tasty Trivia Tuesday will return to the Hampton Room on Tuesday, June 19 with a menu that features Baked Ham with Pineapple Raisin Sauce and Turkey and Gravy. If you think you have what it takes to compete in this knowledge battle, the only way to prove it is to put together a team of your own or join an existing one at the event! On Thursday, June 21, the Hampton Room will once again be hosting the fun. This time, it will be a Classic Rock Party featuring The Cara James Gang playing all of your favorite classic rock hits from the 60's, 70's, and 80's. Doors for this event will open at 6:30 pm with the music following at 7 pm. There are still plenty of golfers hanging around our courses this summer, and the best ones will be competing in the Men's Pinehurst Major Championship Event on June 11 and 12. They will also be playing in the US Open-style US Impossible Tournament on Saturday, June 16. If your golf game isn't quite up to competition level, you might want to attend one of Golf Pro Wayne Larsen's free clinics this month. Wayne will be working with beginners on June 4, 5, and 6. Then he will be back to work with intermediate golfers on June 12, 19, and 26. But if golf isn't your thing, there will also be a Pickleball Summer Bash on Saturday, June 16. The big holiday on the calendar this month is Father's Day on June 17, and between Skyview Restaurant and The Grille, there’s going to be plenty to choose from. Skyview will be hosting an over-the-top brunch buffet that every dad will love. But if you aren't able to make it to brunch, you can plan on having one of the four Father's Day Entrees that will be available that evening at The Grille. The Grille is also planning a Burgers and Brews event for Thursday, June 28 that will feature Salmon Burgers, Jerked Turkey Burgers, Bacon Bourbon Burgers, Surf & Turf Burgers, and Veggie Burgers along with some delicious craft beers to choose from. And, as always, keep a moment for yourself this month. BellaVita Spa is offering Summer Berry Facials, Pomegranate Lime Ultimate Spa Pedicures, and Sweet Citrus Massages as their specials all month long. So, you really don't have any excuses at all not to get out and get active here at the Villages of Citrus Hills this month! There is nothing in the world quite like the thrill of a gaming experience done right, and thanks to a brand new $100 million expansion to the Seminole Hard Rock Casino in Tampa, residents here at the Villages of Citrus Hills can now treat themselves to an extraordinary experience any time they feel like making the 90-minute drive down to Tampa. The massive expansion project at the Seminole Hard Rock Casino in Tampa took about two years to complete, and it has improved the facility to the point where it can legitimately claim to offer one of the biggest and most luxurious gaming experiences in the entire world. And in true Hard Rock fashion, the grand opening included a ceremonial guitar smashing! Let's take a closer look at some of the impressive new amenities you can find there! The most significant addition to the Seminole Hard Rock Casino is the massive new gaming floor that is completely smoke-free. While many casinos offer limited non-smoking sections with older machines, this enormous space features over 800 of the newest and most popular slot machines, like Michael Jackson Icon, as well as five live-action blackjack tables. The new smoke-free gaming floor also features convenient entrances and exits that are right next to valet and ride-share drop-offs, so you won't have any trouble finding the place. You can also enjoy a cocktail at the Video Poker Bar or watch the biggest game of the day on one of the 20 flat screen televisions throughout the smoke-free space. Poker enthusiasts will be blown away by the look and feel of the brand new, 46-table poker room that offers Wi-Fi throughout, a sports bar, and more than 40 flat screen televisions. If poker is your thing, the new poker room just became your favorite place in the world. With seven different smoke-free dining options to choose from, finding a great meal at the Seminole Hard Rock Casino is never a difficult task. Visitors can dine at the new Council Oak Steak & Seafood, or head over to The Rez Grill, Hard Rock Cafe, Fresh Harvest Buffet, Rise Kitchen & Bakery, Rock 'N Raw, or Jubao Palace Noodle Bar. As if the new spaces at the Seminole Hard Rock Casino were not already impressive enough, the expansion also included some upgrades to smoke-free shopping destinations like the Hard Rock Store, Rock Shop, Rainmaker, and the Rock Spa & Salon. So, if you are looking for great shopping, you don't even have to leave the facility! Residents here at the Villages of Citrus Hills have known for years that the Seminole Hard Rock Casino was a fantastic destination for a quick day trip or a weekend getaway, but with the new upgrades and expansions, it has evolved into a must-see destination for just about everyone in the state of Florida. Where else could you find a luxury casino and hotel on the level of a Las Vegas property only 90 minutes from home? The weather is warming up around the country as we move into the second quarter of 2018, and things are heating up here at the Villages of Citrus Hills as well! Over the past few months, residents have seen improvements to the community that have included repaved walking trails, upgrades to the dog park, and a brand-new dock on Lake Marie. In addition to enjoying those upgraded amenities during the month of April, there’s also a wide range of activities and events that are in the works thanks to the wonderful people at the Activity Center. Whether you are looking for fun social events, inspiring educational seminars, golf or tennis competition, or just a great bite to eat, we've got you covered with information on all of the best things happening around the Villages of Citrus Hills this month. Comedian Rocky LaPorte will be performing in the Hampton Room on Tuesday, April 10 at 7 pm. With a performance on The Tonight Show and a feature on Comedy Central Presents on his resume, there isn't much that Rocky hasn't accomplished in the comedy world during his long career. But on this night, his only focus is making you laugh. On April 25, there will be a Dinner Show with Valerie Sneade in the Hampton Room. The meal will include Boursin Stuffed Chicken Breast and Sliced Prime Rib, and it will be followed with a fun, dinner party-style performance where Valerie Sneade will be singing all of those classic pop songs that you used to play on 45s! The Speaker Series returns to the Activity Center Auditorium on Thursday, April 12 when two doctors from Countryside Animal Clinic will be discussing taking the best possible care of your furry, four-legged friends. This event is scheduled to start at 6 pm. Lunch & Learn will be hosting three financial experts from Merrill Lynch on Wednesday, April 18 at The Grille. The lunch menu will feature a Caprese Chicken Sandwich, and the discussion will be focused on how to best manage your retirement assets with a focus on IRAs. Craft lovers won't want to miss the Spring Farmers Market and Craft Fair happening in the Activity Center Parking Lot on Sunday, April 22 from 10 am to 2 pm. In addition to local produce vendors, there will also be some amazing craft vendors selling their creations, as well as live entertainment. There will be a Piano Workshop in the Activity Center Auditorium on Saturday, April 28 from 2 pm to 5 pm. If you have ever regretted the fact that you didn't stick with learning how to play the piano, this is the perfect opportunity to get a quick refresher course to get you playing again! Almost zero experience is required, and you will learn how to continue to develop your abilities moving forward. It is also going to be an exciting month for the ladies with the Skyview Ladies’ Spring Invitational happening on Monday, April 9 and the Citrus Hills Ladies' Club Championship being held on Monday, April 16 and Tuesday, April 17. If you are looking for a more relaxed event, you won't want to miss the April Fool's Open played on The Oaks course on Saturday, April 14. And if you are looking to improve your golf game this month, there will be free clinics hosted by Mary Slinkard happening throughout the month. Over at the Skyview Tennis Center, the Men's and Women's Club Championship Doubles Tournament will take place on April 20-22. But if you aren't quite up to that level of competition, you might want to check out the Free Beginner Tennis Clinic on Tuesday, April 10. As they do every month, our friends at Skyview Restaurant are going to be going all out on their dinner specials in April. Two that we are most excited about are the Farm to Fork Dinner on Thursday, April 5 and the Asian Buffet Night on Thursday, April 26. The Grille will be serving up all of your favorite dishes as part of their "Grille Favorites Menu" on Thursday, April 12, and they are also planning a fun "Tax Day Menu" for Tuesday, April 17. Reservations will be required for Alfresco Spring Elegance night at the Tiki Bar on Thursday, April 26. This is the one special you definitely don't want to miss this month, as it will feature delicious surf and turf options along with live entertainment from Snap Dare. In addition to all of the fun activities and events happening throughout the Villages of Citrus Hills this month, BellaVita Spa is running specials on Coconut and Lavender Sugar Back Scrubs and Ginger Facials. And with all of those options available, the choice is yours on just how active you want to be in the month of April! Residents here at the Villages of Citrus Hills often start out their wish list of weekend getaways with popular Florida tourist destinations like Orlando, Daytona Beach, Miami, and Key West. But after exploring many of the most popular destinations across the state, they often find that it is the little towns in between that are the real hidden gems. Port St. Lucie is one of those places. Located along what is known as "The Treasure Coast," Port St. Lucie sits on the Atlantic side of Florida just north of West Palm Beach and about three hours south of Daytona Beach. If you are looking for a weekend getaway filled with affordable hotels, stunning golf courses, and delicious dining, this is the hidden gem that you have been looking for. Whether you are planning on golfing or not, the best place to stay in Port St. Lucie is definitely the Sheraton PGA Vacation Resort Villas. This fabulous facility will have you feeling like you are staying at a tropical resort for a price that is comparable to (and often cheaper than) the nearby Holiday Inn Express. All of the rooms at the Sheraton are either one-bedroom or two-bedroom villas that come complete with separate living areas, kitchenettes, and even dining tables, so you will feel right at home here. The resort also offers an elegant outdoor pool, access to fishing in the St. Lucie River, and a full staff of experts who will be available to help you book your tee times at local golf courses. With over 30 beautiful golf courses to choose from, there is no beating around the bush about the fact that you are going to be bringing your clubs to Port St. Lucie. And, the PGA Courses are at the top of just about every golfer's list for a weekend round. But in addition to those championship-level PGA courses, visitors will also find places like Legacy Golf & Tennis Club and Hammock Creek Golf Club to be up to their standards. If you happen to find time outside of golfing, we also recommend hitting the local waterways in Port St. Lucie. Whether you prefer to rent a fishing boat out on the St. Lucie River or to relax in the sand during low tide at Walton Rocks Beach, there is something so soothing about the water on a weekend getaway that will make you feel like all is right with the world. The culinary scene in Port St. Lucie offers selections from around the world. If you are looking for a unique dining experience, you might want to try making a reservation at Fernando's Dockside Grille for Portuguese and Mediterranean cuisine or Machu Picchu Restaurant for a Peruvian meal. But if that international flair isn't quite your style, there are also plenty of classic American options like Buffalo Chophouse, where you will find a full range of traditional steak and seafood dishes. For a casual meal in a fun environment, it's hard to beat a good Irish pub, and that is precisely what you will find at Shindig Irish Restaurant & Pub. Their menu features all of the classic Irish dishes like Fish & Chips, Bangers & Mash, and Shepherd's Pie, but they also have plenty of Florida seafood options, as well as a selection of American pub food. And for a quick meal on the go, it doesn't get any better than Taco Dive. This self-described "hole in the wall" uses nothing but fresh ingredients to create some of the most interesting tacos you will find anywhere. The classics like steak, pork, chicken, and beef are all good here, but don't sleep on the BLT Dive Style taco that features Applewood bacon, fried egg, pimento cheese, arugula, and tomato! 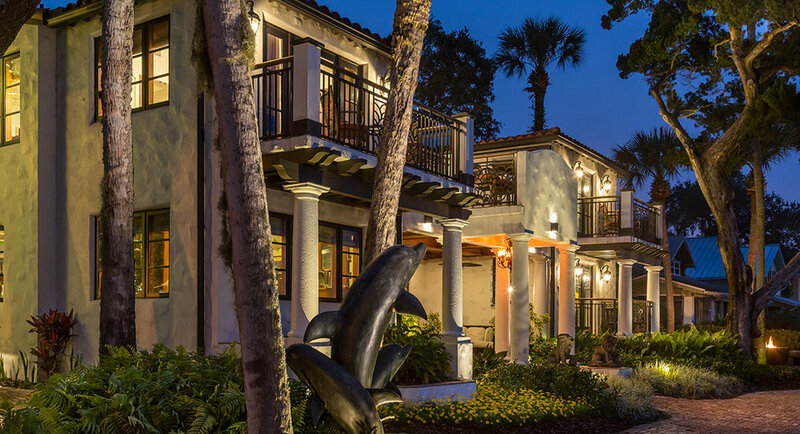 We certainly don't blame you if you prefer to start your weekend getaway wish list by checking out some of Florida's best tourist hotspots. But make sure that you keep the golfers' paradise of Port St. Lucie on your list as well because this is one of the best-kept secrets in all of Florida!